Another ROW80 Goals or otherwise post. Having succumbed to a common garden-variety cold (and passing it onto the rest of the family, sigh), for most of the week, I am happy to say that in spite of this, I managed another 10,000 words, and three more short stories for my collection. I’ve now completed N, O and P. As a completely worthless clue to the overall storyline, N is for the Norm, O is for the Occasion, and P is for the Policeman. And I very much like the characters that popped out in “the Occasion” so I’m sure we’ll be seeing more of them in another project soon. 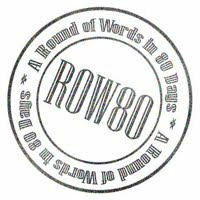 I believe that we’re over halfway through this 80 day round of writing for ROW80, so this is a good place to re-assess my month’s writing goals. Although I think I am still on par to get through some more short fiction in the next week, I think finalising the first drafts may take me a little way into June. As the later stories form, there is more need to tie them in with the previous stories, to create the overall story arc. This slows things down a little, because I am going back to tidy up older stories, and add in some breadcrumbs. But it’s nice to be able to see the finish line coming up. I’m hoping to hit a full-on editing phase mid-June.